The Guinness World Record Award which was created in the 50’s and has a worldwide presence thanks to its offices located in every continent, is constantly searching for amazing happenings, and Delphinus is one of them, do you want to know why? Part of the Guinness World Record philosophy is based on inspiring people, individuals, schools or entire communities to read, see or hear how incredible some institutions are, which is what happened with Delphinus. The swim with dolphins in Mexico programs offered by Delphinus, especially in Xcaret, are about more than just living a magical interaction with dolphins, because it is in this habitat that the Delphinus breeding program takes place. In 2009, Delphinus entered the Guinness Record book by having the highest number of successful dolphin births in 2008, all of them in Delphinus Xcaret, and not only that, 100% of the offsprings and their mothers survived. How does the Delphinus Breeding Program work? It is very important to recall that everytime that we notice that a dolphin is pregnant, we stop its interactions and the Delphinus expert vets provide it with nutritional supplements to keep it as healthy as possible. Once the offspring is born, it is placed in an area that is removed from where visitors swim with dolphins in Mexico. This way, it is in a special environment designed to minimize any risk for both offspring and mother. The offspring shouldn’t be separated from its mother because the care and the breast-feeding she provides is vital for the baby dolphin to survive. The dolphin calf must be fed by its mom at least during the first 2 years after birth. This accomplishment by the Delphinus experts is what makes us part of the Guinness Records book because we’re not just interested in having you swim with dolphins in Mexico and live an incredible experience, we are also concerned with making sure our community of dolphins grow in a natural way and don’t lose any of the behaviors that are innate to their specie. It’s very important to emphasize that reproduction is one of the most important moments in the wellness of a wild specie under human care, because a lot of circumstances such as good health, appropriate spaces and food abundance among others, have to be met to welcome a new dolphin; this is why the breeding program is considered a wellness indicator of an animal specie. 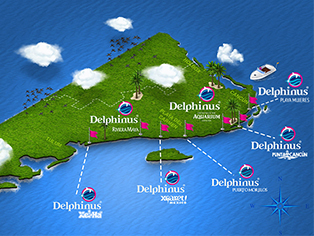 Do you want to know more about our Breeding Program in Delphinus? Check this out! Come to Delphinus, swim with dolphins and live a unique life experience interacting with one of the most incredible and intelligent mammals in the ocean.